cities around the United States have left their marks with their architecture, businesses, and cultural activities. When you are looking for a way to share your city with other people, the gifts at MyFavoriteCity.com is the best place to start. These are a few of the options that you will find at this website that is dedicated to providing excellent gifts of food, souvenirs, and memorabilia for over a decade. Businesses like to share their cities with customers, clients, and new employees. When businesses executives are wooing new customers, the send gift baskets that show off what they and their city have to offer. One of the most popular gift baskets for corporations is the relocation gift basket that lets a new employee know what is available in the new city. Customers who have to fly into the city appreciate gift baskets in their hotel rooms. And, when businesses are trying to share their identity without being too obvious, a gift basket full of city items tones down the corporate identify gifts. What Goes in a Gift Basket? If you are giving a gift basket to show off everything that your city has to offer, there are several things that you can choose to include. Some of the most popular items for city baskets include mint tins that showcase photos of big cities like Chicago, New York, Boston, Las Vegas, and Seattle. Everyone loves a tasty chocolate bar and our bars are wrapped in city-themed wraps covered in photos of major landmarks, too. If the big city has a professional athletic team, you can add a bottle or can koozie to your basket. Some other popular additions to city baskets include seeds from flowers in the area, skyline puzzles, pop-out travel maps, along with plush animals designed for each city and embroidered with the city name. For example, the Washington DC plush animal is an eagle, the Florida plush animal is a flamingo, and the Colorado plush comes as a bison and a moose. If you prefer to send food as a gift basket, MyFavoriteCity.com has plenty of options to make the recipient happy. Depending on the city you want to showcase, you can choose from a wide variety of foods that display what the city is known for in its restaurants. If you are sharing your love of the state of Georgia, you can design a basket full of foods that are grown in the great state. These include chocolate-peach truffles, Georgia peanuts or pecans, and peach butter. The recipient will appreciate the flavors that are unique to Georgia. If you prefer to avoid sending food, you could choose to send a souvenir basket to share your appreciation your state or hometown. These gifts might include one or two food-related items, but most of the items are useful things that are labeled with a logo that features the city of your choice. 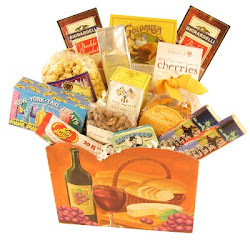 One of the popular choices is the San Francisco basket that you can fill with items of your choice. Some of the most fun items include a small cable car magnet, Ghiradelli chocolate bars, Alcatraz Mint Tin, and the City Walks map of the town. To show off Pittsburgh, gift givers could create a basket that includes tasty treats like Clark Bars, Heinz Ketchup, Mallo Cups, and Isley’s Barbeque Sauce. The non-food items that are uniquely Pittsburgh include several postcards covered with Pittsburgh’s skyline, koozies that represent the Pirates and the Steelers, and a few different coffee mugs and shot glasses. Whether you want to spend $20 or over more than $100, you should be able to find a gift basket and fill it with items that show how you feel about your state or city. Some of the popular gifts that can be customized to fit your city’s personality include items like postcards, coffee mugs, shot glasses, magnets, and pop up maps. Everything that you could include in a gift basket is useful. While many people think about using gifts for business purposes, they can also be given for more personal events. Gift baskets are great choices to give to guests who visit from out of town for a wedding. They can be left with the hoteliers, so that the guests receive them when they check in for the evening. If you give a gift basket for wedding guests, be sure to include some food gifts. A gift basket is a good choice to give to friend who needs to get well soon. They are also ideal gifts to give as a housewarming gift to your new neighbors who have moved from a far-away state. There are several ways to package a gift basket full of city and state related gifts. When you order a gift basket, you can always have the gifts presented in an actual wicker basket. Gifts can also be given in colorful boxes. Smaller gifts can be presented in clear cellophane bags, too. When you package your city destination gifts in an attractive package, your recipient will be even more appreciative. You can also have your package wrapped in bows and other embellishments, too. MyFavoriteCity.com has over 1,000 in-stock items to for the ultimate fan. City slickers can finally choose to give a gift that shows how much they love the city in which they live. It can be addicting to buy state-related events, especially if you are unable to travel for whatever reasons.